Five...Four...Three...Two...One...Happy Birthday! This week we had a very special birthday celebration with Colleen Kessler. 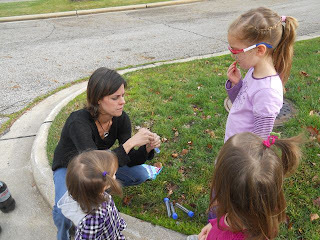 She is a local non-fiction author who has published numerous books including many for teachers -- Super Smart Science, Hands-on Ecology: Real-life activities for kids, and Picturing Math: Hands on activities to connect math with picture books. I met Colleen through the Northern Ohio chapter of the Society of Children's Book Writers and Illustrators. I expressed interest in celebrating her birthday and she responded, "Sounds like fun! 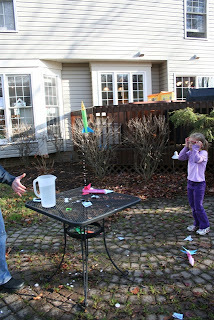 Bring the kids over to the house and we can do science experiments!" After the celebration date was set, I mentioned to my kids that we were going to an author's house to make rockets and exploding geysers and they began counting down the days to the event just like the mission control center at NASA! Upon arriving at the Kessler house, Colleen immediately engaged our two families (and many children in the neighborhood) in making Mentos-Diet Coke Geysers. For Colleen, a former teacher and currently a homeschooling mom, it seemed better to have more kids involved! 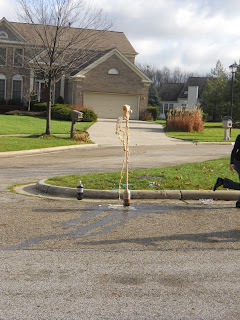 She supplied 5 two-liter bottles of Diet Coke, about 10 rolls of the white Mentos chewy mints (this included lots of extra mints for eating), and mentos geyser dispensers (these are available on Amazon.com - Steve Spanglers Geyser Tube ). 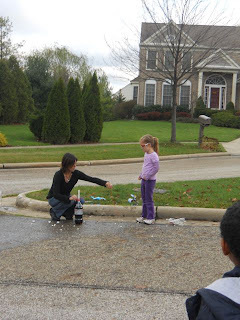 Colleen shared Mentos with the girls as they prepared the geyser dispenser. She explained that the Mentos chewy mints have a hard coating that causes a reaction with the soda pop. (Check out the Mythbusters video below for more information). I was given the honor of exploding the first geyser. I like this picture of me with Colleen's son running away because it looks like I did a great job. 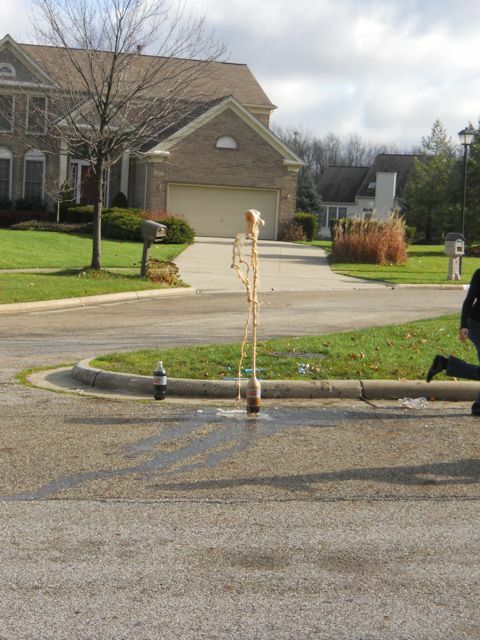 However, I failed miserably as only one mentos candy dropped in and I was splattered with Diet Coke! Colleen showed everyone how to do it correctly. 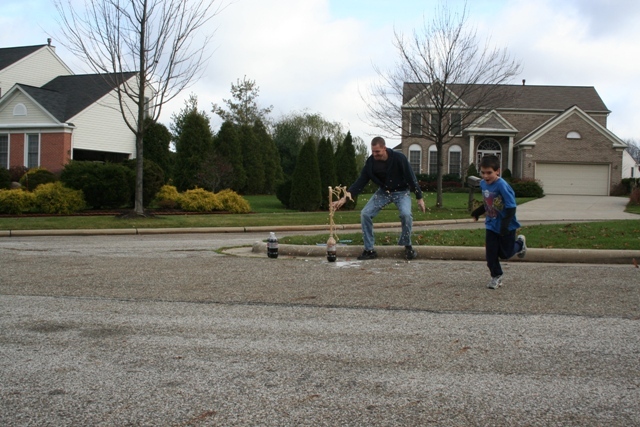 My daughter used a Mentos dispenser that had a pull-cord which was perfect for the kids (I probably should have used it too). 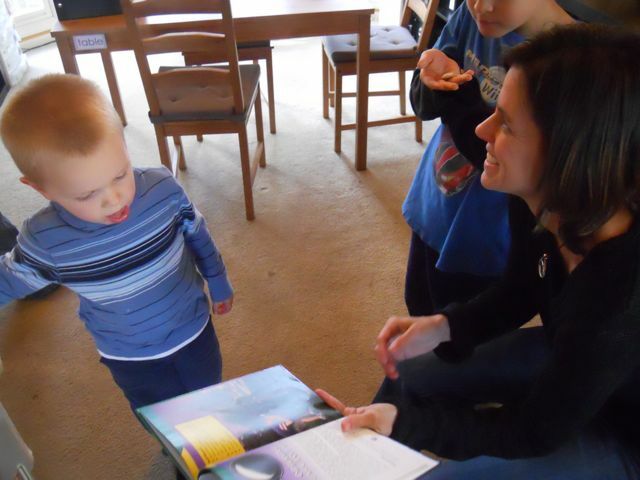 The second activity that Colleen Kessler had planned for her birthday celebration was from her book, A Project Guide to The Solar System, which is one of seven books available in a series that she has written. The opening pages of the book mention important scientists -- Copernicus, Galileo, and Newton -- and how their theories and contributions built upon each other to provide the foundation for future discoveries. Each chapter of the book -- fourteen in all -- provides a project to investigate ideas in more depth. 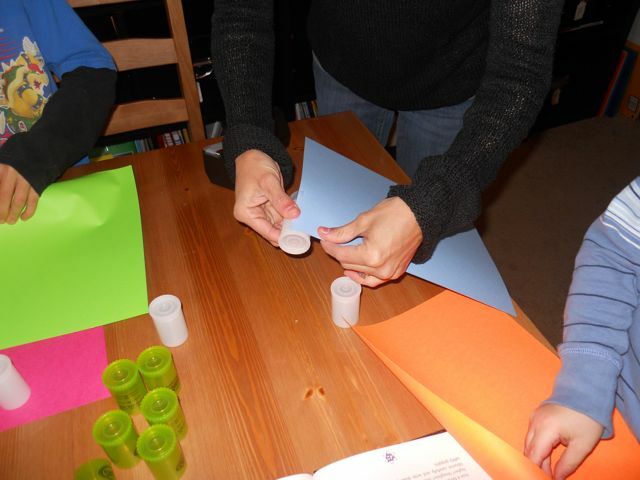 Step-by-step directions are provided to make cocoa craters, sundials, homemade micrometeorites and even ROCKETS! 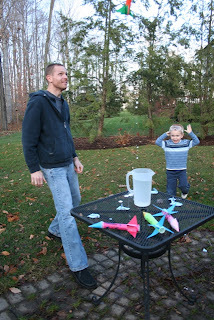 Colleen showed my son the directions and a full color photograph of the rocket he would soon be making. 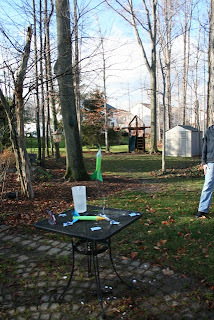 We started our rocket with a small plastic film canister. (Ask your local photo developing center such as Walgreens or CVS if they have any of these containers.) We taped a piece of construction paper near the end of the canister with the lid (we started by attaching the short end of the paper to make shorter rockets). Make sure you leave about an 1/8 inch of the film canister sticking out of the paper. The rest of the piece of paper was tightly wrapped around the rest of the film canister and then fastened with tape along the edge. 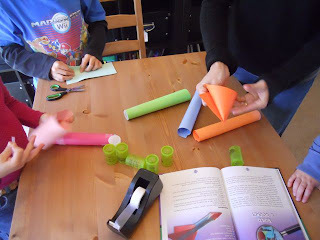 Next, we made a cone for the top of the rocket. After we shaped it correctly we trimmed extra paper off the bottom of the cone to make it even. 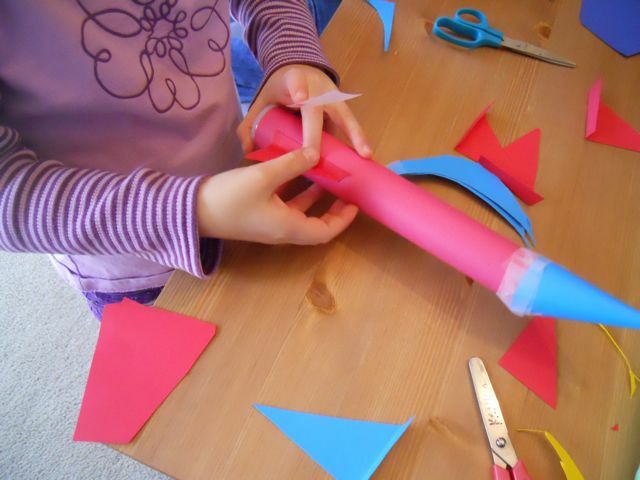 Here my daughter used tape to attach her cone to the top of her rocket. Then, we cut triangle shaped pieces of construction paper and made a slight fold along the base that gave us an area to tape the fin on our rocket. 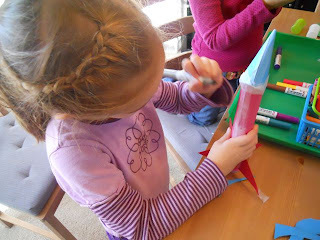 Lastly, we decorated our rockets with markers! 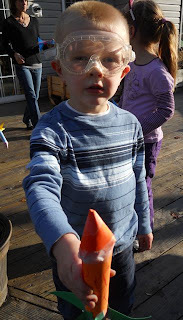 My son was ready to launch his rocket. He was a true scientist by wearing safety goggles to protect his eyes. 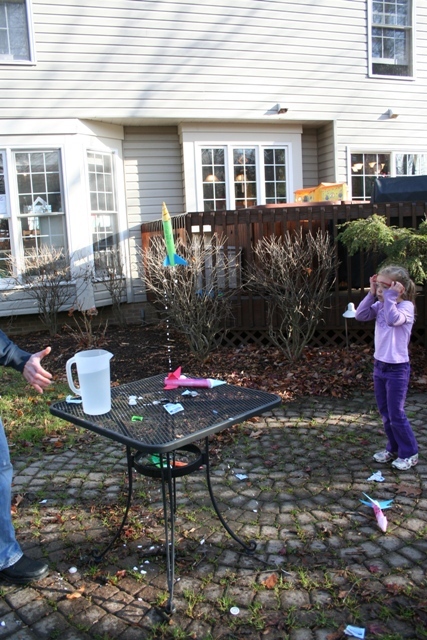 To launch our rocket, we tipped it upside-down, opened the film canister, and placed in two effervescent antacid tablets (Alka-Seltzer). When we were ready, we added enough water to cover the tablets. The hardest part was quickly putting the lid back on the canister to prepare for lift off. 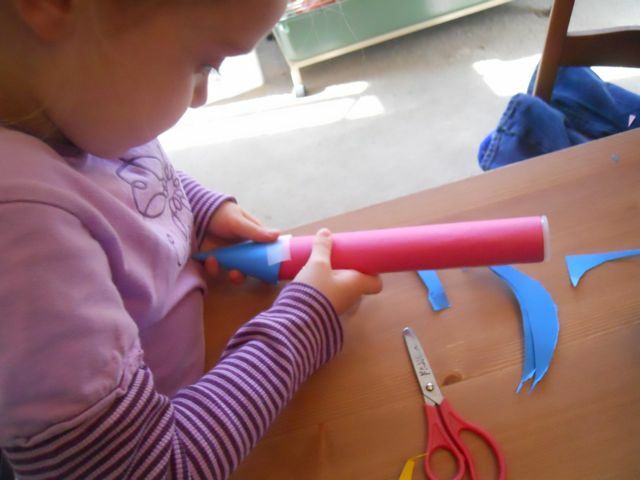 We learned quickly that if our paper was attached too close to the edge of the film canister the lid wouldn't go on! We had many successful launches in the backyard! Our time spent with Colleen Kessler and her family was a BLAST! As far as birthday memories go...I don't have too many wonderful ones to share. Since my birthday is so close to Thanksgiving, I always got shuffled to that day as the family was already gathering. We'd have a birthday cake as one of our desserts and the relatives would bring my presents to Thanksgiving dinner. I DO remember one year, though, that stands out. I had a few girlfriends sleeping over -- just two or three, not a big party, and we slept in the rec room, in the basement (a very spooky basement) of our house. It had been snowing a lot that day (one of the things I hated about being born in November -- my brother got to do the fun outdoor and swim parties since he was a summer birthday, and we were always stuck inside for mine! ), and we were finally snuggled in for the night around the smoldering fireplace that the basement had. About one or two in the morning we woke to a crash. When we finished screaming, and my dad came down and flipped on the lights, we saw a BIG bird -- I still don't know what kind it was -- had broken though a part of the wall that was exposed to the outside. There were nest remnants -- and ice and snow and dangling legs -- all over the basement...well, the dangling legs found their way out pretty quickly and vanished. Needless to say...none of us slept much after that and we'll all remember that sleepover party forever! Our fun science day also included birthday cake! Happy Birthday Colleen! What a fun post, Eric! I LOVE it! Thanks for including me on HBA. I had as much (if not more) fun as you did. Bring the kids back soon! And... I didn't realize that FREE RESOURCES was up on Amazon already. 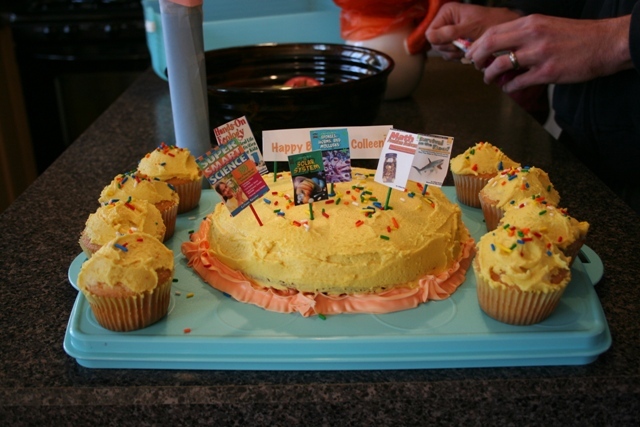 For the readers of this FANTASTIC BLOG -- Happy Birthday Author is featured in that book (slated for April) as a fabulous resource for homeschoolers and classroom teachers who want to know the BEST way to engage kids in books. Ummm... and I didn't share the leftover cake with anyone. Was that wrong of me?? Thanks Colleen! I am looking forward to FREE RESOURCES -- as I am always looking for a way NOT to spend money! P.S. I tend to devour birthday cake leftovers too!